is a classic french beef stew recipe made with full body red wine, beef chunks, mushrooms and onions which simmers in the oven for a minimum of 2 hours creating a velvety rich sauce. Pick a nice bottle of wine without much tannin such as a Pinot Noir or Côtes du Rhône. Côtes du Rhône wine worked perfectly. The bottle ran about $15 and since you do not use the entire bottle in the dish, you'll be able to enjoy a glass or two with your meal. I generally do not pay that much when I am cooking with wine, but I felt Beef Bourguignon was worth a little extra. No need to spend a lot of money on the beef. Any chuck, rump roast or even a stew meat will work fine. Shop price, it it's on sale get it. Don't worry, the meat will be tender as the Beef Bourguignon cooks at a low temperature in the oven for a long period of time. Use a large heavy sauce pan or cast iron pot that can be covered and put in the oven. You will use the same pan for the entire preparation, so pick one that you find easy to work with. I recommend the fresh pearl onions rather than bottled or frozen. Just boil the onions in water for 10 minutes, cool, cut the root end off and squeeze between thumb and first finger. Onion will pop right out. If you decide not to bother with the pearl onions, increase the recipe to 2 medium yellow onions. You will need a paper towel, large slotted spoon and a large bowl for the saute process. I must say, Beef Bourguignon was a delight to make. I adapted this recipe from Julia Child’s recipe from "Mastering the Art of French Cooking". If I was making this for a large group, I would prepare it a day in advance and just make the sides on the day of the dinner. You will definitely want to serve a loaf of french bread, you won't want to leave all that nice gravy on your plate. Saute bacon in heavy sauce pan or Dutch oven over high heat until browned and crisp. Using a slotted spoon, transfer bacon to paper towel. Place bacon in large bowl and set aside. Mix flour with salt and pepper. Take your paper towel dried beef pieces and dredge through flour, using all the flour. Work in small batches, searing beef pieces in same pot over high heat until well browned. Transfer meat to bowl, continue searing the meat in batches and placing in bowl with bacon. Set to the side. Add the olive oil to the same pan. When heated add onions, carrots and celery, sauté until light brown, add garlic and sauté for another minute to blend. Transfer vegetables to bowl with beef. Add butter to pan and saute the mushrooms. Transfer to bowl with beef and other vegetables. Add 1 cup broth to pan to deglaze, boil until reduced, scraping up browned bits. Add wine, thyme, tomato paste and the rest of the beef stock. Bring to boil, stirring occasionally. Carefully spoon the entire contents of large bowl to the pot of liquid. Beef should be completely covered with liquid. If you need more, add more wine or beef stock. Cover the pot and place in oven on a low rack. Cook 2 to 4 hours at 275°F, the longer the better. One half hour hour before serving time, add the pearl onions to the pot. At this time prepare your sides, boil potatoes to mash and steam sugar snap peas. Slice the french bread and wrap in foil and stick in the oven until all is ready. To prepare a thick gravy, use the slotted spoon and large bowl, spooning the stew meat into the bowl leaving the rich velvety sauce in pan. Carefully pour the sauce from the large pan into a small sauce pan. Spoon off fat if any, bring sauce to a boil to reduced. Put the stew back in the large pan and cover, placing it back in the oven to keep warm. Once the sauce has been reduced pour all the liquid back over beef and vegetables or keep as a gravy to ladle onto your plate at the table. Time saver! For preparation ease and time saving, have all the ingredients chopped, sliced and measured before you start any cooking. 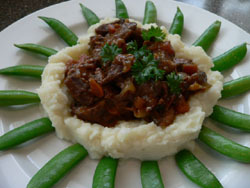 Suggestion: Beef Bourguignon can be prepared 1 day ahead. Cover and refrigerate. Rewarm over low heat before serving.